When embarking on a freelance editing career, set your sights on a clear path for successful work: choose a niche, build a portfolio, set your rates, and start looking for work. Know the difference between its and it's? What about their, there and they're? If you have a knack for noticing the small stuff and have a solid background in English (or any other language), it is possible to make money working from home as a freelance copy editor. But how do you get started? Here's what you need to know about how to become a freelance copy editor. Copy editors check not only for grammar and spelling errors, but for things like flow, style and consistency. With the growth in the number of self-published authors, the need for good copy editors is growing. Freelance editors can work on anything from resumes and technical documents to websites and novels. If you are sitting at home wondering what in the world to do with your English degree, you may already have all the skills you need to get started. But if you don't have much background or anything in your resume to show why you'd make a good editor, you can't just start looking for work right away. Take an online class. Look for internships. Pick up a few editing books. If you don't know what the Oxford comma is or when to use it, you're not ready yet. There's a zillion copy editing opportunities out there. To make sure you're not wasting time on applications, narrow down the type of work you would like to do. Does the thought of editing a set of technical instructions make you gag? If so, consider specializing in novels. Have a technical background? Then you already have a step up over the competition if you specialize there. Choosing an area doesn't mean turning down work outside that area, but it helps you look for the right jobs and, more importantly, makes you stand out to potential clients. When it comes to editing though, there's more to specialize in than just the type of document—you should also choose a style guide (or two). Style guides answer the question when more than one option is technically correct. Chicago is typically the style used in books, while most newspapers and news organizations use Associated Press (AP). Academic writing has even more styles, depending on the subject. Pick up a style guide for the genre you'd like to specialize in and get familiar with it. The biggest tool you will use to obtain new editing clients is a portfolio. Depending on the type of work you do, you could create a print version or build a website with a portfolio. But an editing portfolio is a little different from just a writing portfolio. A copy editor's portfolio should include a "before" and "after" snapshot of the work. Make sure to save a copy of the original—never make changes without first saving an extra copy of what you started with. Then, make marks as you edit, either by hand on a printed document or using the Track Changes feature in Microsoft Word. 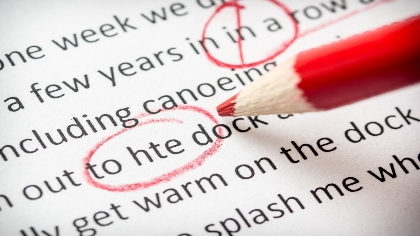 Include a copy with the editing marks, and then also add a clean, mark and error-free final copy, too. It's also a good idea to include a brief description of the work, including where the document was published, if applicable. Don't have anything to edit and actually put in a portfolio? Don't worry, everyone starts somewhere. Ask friends if they need anything edited or offer to help out a non-profit with a publication for no charge. Early on, it's okay to offer big discounts in order to pick up multiple clients and build a portfolio. One of the more challenging parts on getting started is deciding what to charge. If you are just starting out, you won't get many clients if you charge as much as established editors, but you don't want to sell yourself short, either. There's a few tricks to setting the right rate. The first is to time yourself and see how long it takes you to edit something. Then, consider you goals—how much do you want to make an hour? The second is to look at what others are charging. The best way to do this is to pick up the most recent edition of Writer's Market—there's a chart at the beginning that details the high, low and average rates of a variety of different writing and editing jobs. If you are just starting out, you'll want to set your prices on the low end. If you have a highly specialized niche area (engineering, for example) you can likely do well even by charging towards the middle to high end. Most editors tend to charge by the word, but you can also charge by the page, project or by the hour. Are you willing to offer a discount for non-profits? Do you charge a little less if the work is ongoing? These are all questions a potential client may ask—you'll want to know the answer beforehand. So you have the know-how and a portfolio to back it up and you won't be stuttering “ummm” when a potential client asks how much. Now, you need to actually find clients. There's a lot of ways to do so, and not one “right” way. Freelance job boards, like on WAHM.com and FreelanceWritingGigs.com are excellent places to start looking, as well as Craigslist ads. You could also join, iFreelance, Elance or Guru, which charge a small fee for connecting you with clients. Or, you could let clients come to you by advertising on writing websites or posting in forums. Don't forget word-of-mouth opportunities and social media either. With the explosion in the number of self-published authors, good copy editors are in high demand. Copy editors check for grammar and spelling errors in anything from resumes to books. They can work from home and the pay isn't bad, either. But in order to get started as a copy editor, you need to make sure you have the know-how and then narrow down an area to work in, develop a portfolio and set rates. Then, you'll be ready to look for work and be on your way to earning an income at home as a copy editor.